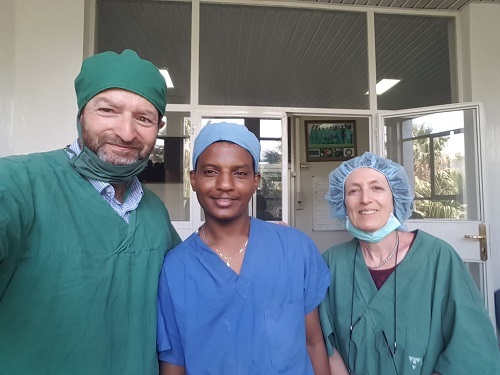 With a mission to help strengthen infection prevention and control at Ayder Comprehensive Specialized Hospital in Mekelle, Ethiopia, infectious disease specialists from the Hadassah Medical Center recently paid a visit to offer their help. Prof. Allon Moses, chair of Hadassah’s Department of Clinical Microbiology and Infectious Diseases, led the team from Hadassah. Accompanying him were Carmela Schwartz, nursing director of Hadassah’s Ambulatory Center for Infectious Diseases; Dr. Shmuel Benenson, head of Hadassah’s Infection Prevention and Control Unit; and Tamara Zeiter, a senior microbiologist at Hadassah. Prof. Moses and Mrs. Schwartz are slated to head up Hadassah’s new Infectious Disease Center, scheduled to open shortly. At Ayder Hospital, the Hadassah team emphasized the need for education in basic infection prevention for every single health care worker. The team noted that some of the units that were demonstrating good infection protection practices could be role models for the others.